It seems unlikely that any business would try to rebrand in two days (and the rumors have been floating for at least that long), but no brand image expert could blame Weinstein senior management for wanting to distance the company from the name. Although the Board was smart to terminate Weinstein quickly and condemn his behavior, a rebrand probably won’t accomplish their goals until the crisis is over, and there are signs that more shoes will drop. A rebranding can be part of a smart strategy for moving past a reputation crisis. The low-cost airline Valujet became AirTran after a fatal crash that was found to be the result of negligence. Who would want to fly Valujet after such a disaster? After Lance Armstrong admitted to years of doping, his foundation attempted to move forward under the Livestrong name, with mixed results. Even the former Kentucky Fried Chicken seemed to take on a slightly more health-oriented image after it slimmed down to become KFC. But a rebrand isn’t a magic bullet, especially if nothing else has changed for the company involved. And The Weinstein Company’s rush to rebrand in the wake of scandal offers an opportunity to visit each of the circumstances that don’t really stand alone as a rationale to change one’s visual or brand identity. 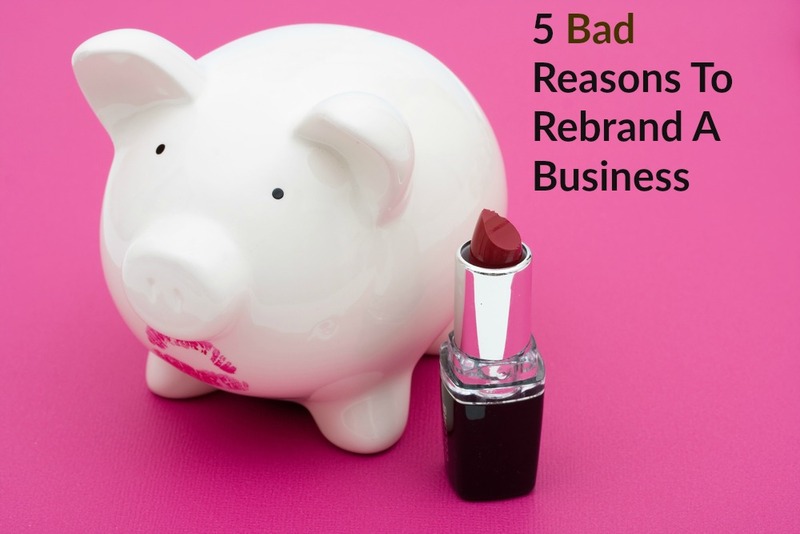 Here are some of the top reasons not to rebrand. To distract from internal problems. Internal problems are, by definition, inside an organization, so a rebranding to move past institutionalized behavior is like a band-aid on a bullet wound. No rebranding can rebuild a reputation if the would isn’t disinfected and treated. In the case of The Weinstein Company, Harvey Weinstein’s termination may not be enough in the face of signs of systemic tolerance of sexual harassment by its cofounder. To generate publicity about the business. If the issue is an absence of news, there are far better and more long-lived ways to generate positive visibility for a company. Only in the cases of extremely large, multinational organizations is a rebranding big news, and in many cases there’s a risk of backlash. Occasionally marketing or communications executives cook up a rebranding because they want to signal a new direction, or even to distract from sluggish business indicators, but it’s nearly always a bad idea. Sometimes a new CMO will call for a rebrand in order to make his mark, or the arrival of a CEO from outside the company induces thoughts of a new identity. But if the Weinstein lesson tells us anything, it’s about not letting an individual dominate the brand’s identity, or even its strategic direction. The most effective rebrandings are rooted in a company’s business goals and the brand’s relationship with its key audiences, including customers, stakeholders, partners, and employees. If the new arrival doesn’t change the company’s mission, strategic direction, or value proposition, there’s no compelling need to rebrand. Competitive pressures or even category changes can make senior management think a rebranding is in order, but, again, a vague sense that the brand could be left behind isn’t necessarily enough to warrant a full-scale restage. In the case of a rapidly evolving industry, a new brand identity should symbolize how the business is actually meeting changes and challenges, instead of being a statement on industry status or a shallow marker that it’s up with the times. To hasten the end of a reputation crisis. The worst thing a company can do is rebrand during a crisis situation. An identity change can certainly work to help signal a fresh direction after a period of reputation damage, but only if the business has legitimately turned the corner on its problems. A sudden rebrand to hasten the resolution of a crisis, at best, won’t take, but it’s also likely to be seen as an attempt to run away from negative publicity or pressure.